Cymbidium goeringii REI: Korean name is CHUN-RAN (= Spring Orchid). 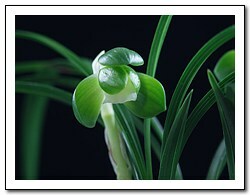 Call Orchid grass that blossom in the spring as Asian Spring-Orchid. Spring-Orchid grows spontaneously and gives native name that grow spontaneously each in front in the Korea and China, Japan, Taiwan and is called Korean Spring - Orchid(CHUN-RAN), Chinese Spring - Orchid(CHUN-LAN), Taiwan Spring - Orchid(CHUN-LAN), Japanes Spring - Orchid(SHUN-RAN). Korean Spring - Orchid and Japanese Spring - Orchid belongs in botanical same position and scientific name is same by Cymbidium goeringii REI. On the other hand, Chinese Spring - Orchid and Taiwan Spring - Orchid botanical scientific name itself by other distinct species almost distinction have fundamental difference with hard Korean Spring - Orchid, Japanese Spring - Orchid summer period and distinction is easy. Species which Spring-Orchid itself who grow spontaneously in China recently is very resemblant with Korean Spring - Orchid are found, theory that these will not must see as scientific name Chinese Spring - Orchid, Korean Spring - Orchid that is not Orchid's Cymbidium forrestii - Orchid's Cymbidium goeringii is strong. That is, resemble distinction painfully summer period almost with Korean Spring-Orchid than Chinese Spring -Orchid as well as doing not have incense that is Orchid's special quality burning at the stake Chinese Spring - Orchid. Form of typical orchid flower have Spring-Orchid petal of 6 chapter which is consisted of Dorsal sepal, Lateral sepal (3chapter)and inside Petal, Labium have. Color and personal appearance of these petal decide appreciation beauty. Leaf length shows ordinary 10 ~ 30cm, length of flower stalk is about 20 ~ 50cm, show difference gradually same species according to cultivation. Raise have wild saw-teech to edge of leaf, and cause change of various pattern and do appreciator. Radices is thick and long, in bulb justly grow up. 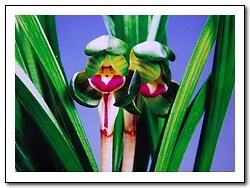 If go to Korean southland, it is familiar explaining Cymbidium goeringii Reicfb that is seen. Had acted as that inform the spring. Rise by Cymbidium goeringii Reicfb to illustrated plant book for this reason. Cymbidium goeringii Reicfb that is distributed so extensively and is known is not Korean Spring-Orchid all. Green flower blooms to Cymbidium goeringii Reicfb, green leaf that we can assume often in fields and mountains and that have general form that have point to tongue is not recognized gardening does because do Cymbidium goeringii Reicfb. Though have beauty belonging to beauty of flower recognized gardening does and beauty of leaf, become garden plant appreciating by Korean Spring-Orchid. Korean Spring-Orchid is cultivated because most beautiful flower and leaf that can assume in Asian orchid, and because these beautys have do specially eminent appreciator, popularity is formed high most in Korean orchid. Is growing spontaneously, and grow much same native place and southern slow pitch specially hillside or hillock daytime that is above the sea 100 ~ 400m on the whole not that grow in famous altitude if see natural habitat. Corrosion quality has characteristic that abundant soil likes polyploidy and ventilation specially. If observe north boundary line, can know yearly mean 12 ~ 3 degree, that is area that is mild that mean air temperature of midwinter January does not fall by below zero. Usually, "Youngilman" of "Kyongsang-buk province" is Cymbidium goeringii to "Anmyeon-island" of "Chungchong-nam province", seashore inland. It is known as relationship north boundary line. But, including "Kang-won-do's Kangnung", "Kosung", "Baekryeongdo" and main hall of west coast, North Korea mooring of spring flowers is real condition that rise for north distance from one stage more because state that accomplish stock to Ulreungdo of east coast is found..
Only, stock image of "Kangnung" or "Kosung" etc. is looked in limited area extremely. Is real condition that rumor that phenomenon that north boundary line is gone up north like this can assume that is found newly in area that did not find up to now but going north of north boundary line by phenomenon is not globe being warm Tuesday is been said as there is sense for the real. Typical Spring-Orchids that burn one flower to one flower stalk does green color that is basis color to flower dyed clothes basis and it is, and is doing green color that is basis color of orchid as well as leaf to basis. 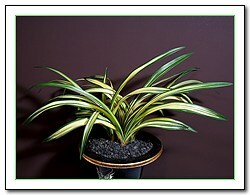 Change by various beautiful flower and leaf in basis color, raise do appreciator and is getting popularity by garden plant. 9 cluster had ever become topic because flower that bloom is found to one flower stalk in "Cholla-namdo Chindo-gun" vicinity the late 1980's one time. Even if resemble closely almost and call la as Korean spring orchid "Korean-Cymbidium faberi" with Chinese spring orchid Cymbidium faberi direction and personal appearance side, scientific name may have to see as Chinese spring orchid Cymbidium faberi. Korean spring orchid pours true heart to find more beautiful flower and pattern species of leaf because may speak that there is not hardly except kind that have several fragrances, search for most flower color and pattern species that show in plant now and is cultivating than sweet-scented Chinese spring orchid. Orchid the spring "Cymbidium goeringii" and orchid the course winter "Cymbidium Kanran(Korean name is HAN-RAN)" have much changes leaf and flower. Is entertained by garden plant by beautiful flower and pattern species of leaf if express same characteristic continually to shoot that these changes are fixed. That is, because special quality of flower called beautiful flower is fixed, it is form if is form, and because flower color is fixed if is flower color, is terminology that call species which can appreciate same special quality continually. Pattern species of leaf or beautiful flower is apriority that color appears well from first all, and as time passes, there is posteriority that color rises gradually. Make to core of appreciation that is clear and dark of peaceful countenance of when color came out apriority or posteriority perfectly with personal appearance of petal before spring thaw in beautiful flower..
Beautiful flower kind is differentiated according to color of flower, according to pattern, according to form. Pattern species of leaf beautiful flower kind while is used in other species terminology the Cymbidium goeringii and Cymbidium-Kanran be limited, and is called garden plant simply in other servant. When have at the same time two beautiful characteristic by flower leaf, give do more tall appreciator.